The Trust’s insight and innovation manager, Claire King, blogs about the launch of our revamped CASHflow tool, now based on the Standard Financial Statement (SFS), and its benefits to advice agencies, creditors and people in debt. ‘Assisted self-help’ has been a feature of debt advice for many years and a central part of the Money Advice Trust’s approach to debt advice. Just under 60 percent of the people we help at National Debtline say they want to get the information and advice they need to then deal with their debts themselves. We know that this approach can help build financial confidence and money management skills – CASHflow is one tool that agencies and their clients can use that helps with this. Launched nearly ten years ago, CASHflow is an assisted self-help tool, available for free to the debt advice sector, which supports people to deal with their debts themselves. We have recently revamped the tool in the style and format of the Standard Financial Statement. The tool enables people to draw up their SFS budget in a format creditors recognise, and have it checked by their adviser. By using a step-by-step approach, with explanations at each stage, clients are taken through the process of completing a budget. As figures are entered, income and expenditure are calculated taking away the need for clients to work this out manually. 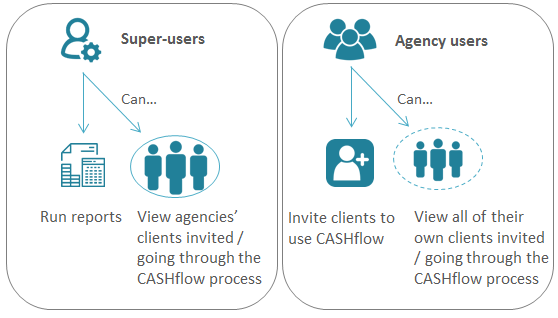 CASHflow provides a unique combination of empowering clients whilst retaining support from an adviser. For a person in debt, CASHflow offers both control and support, enabling them to work through their budget in their own time and in an environment they are comfortable. Each budget is then checked by a trained money adviser before it is signed-off or ‘CASHflowed’, while automatic flags are shown when a client exceeds any of the SFS spending guidelines. This reduces the time advisers need to review a budget and can help advice agencies support clients dealing with their debts this way in one central and secure place. For creditors, time is saved by receiving the right information the first time. They can also be confident that the customer has had debt advice and their repayment offers have been checked by a trained money adviser. Free sample letters are also provided to support the client to engage with their creditors. 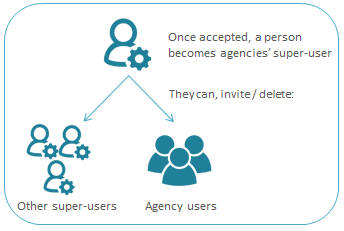 Clients can also provide their creditor with the unique CASHflow ID they receive after the financial statement is signed off allowing the creditor to log in to CASHflow and view the budget online. To use CASHflow your organisation needs to have a Standard Financial Statement licence which you can request at: sfs.moneyadviceservice.org.uk/en/apply-to-use-the-sfs.  To set up your CASHflow account you then need to contact cashflow@moneyadvicetrust.org. 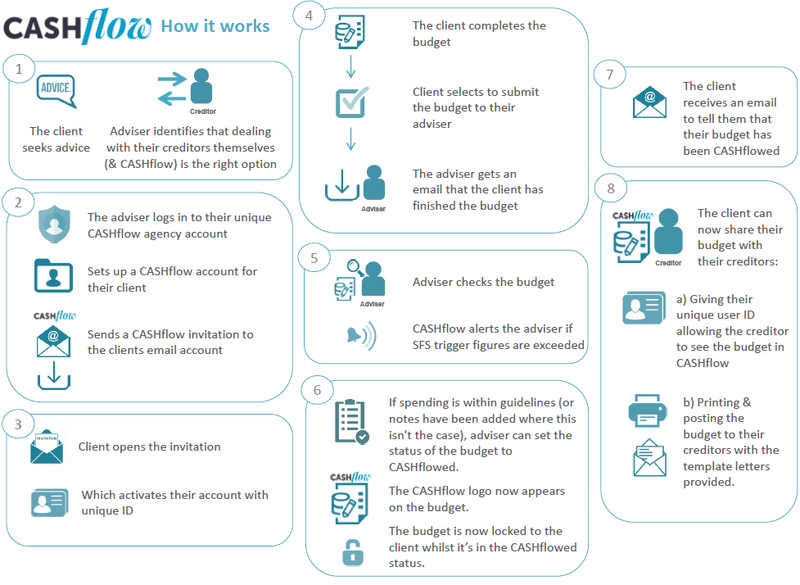 Many advisers may already be familiar with the old CASHflow process and website. If you were registered on the old site you need to re-register to use the new CASHflow site as the old one will no longer be available. For more on how the CASHflow process works please download this useful guide. We want as many agencies to use this tool as possible. Guides on how to use CASHflow are available here. If you have any questions about how best to implement it within your organisation, please do get in touch at cashflow@moneyadvicetrust.org.